Susan Cheever notes that, although Hawthorne and Emerson were a part of the same literary and intellectual movement, they "never really liked each other. Emerson thought Hawthorne's writing too much about the past. Hawthorne thought Emerson too much of the Great Man about Concord." Emerson was quite critical of Hawthorne in his journals as well. 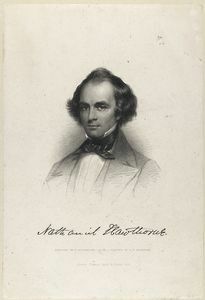 September 1842: “September 27 was a fine day, and Hawthorne and I set forth on a walk…. May 24, 1864: “Yesterday, May 23, we buried Hawthorne in Sleepy Hollow, in a pomp of sunshine and verdure, and gentle winds. James Freeman Clarke read the service in the church and at the grave. Longfellow, Lowell, Holmes, Agassiz, Hoar, Dwight, Whipple, Norton, Alcott, Hillard, Fields, Judge Thomas, and I attended the hearse as pallbearers. Franklin Pierce was with the family. The church was copiously decorated with white flowers delicately arranged. The cropse was unwillingly shown, - only a few moments to this company of his friends. But it was noble and serene in its aspect, - nothing amiss, - a calm and powerful head. A large company filled the church and the grounds of the cemetery. All was so bright and quiet that pain or mourning was hardly suggested, and Holmes said to me that it looked like a happy meeting. Clarke in the church said that Hawthorne had done more justice than any other to the shades of life, shown a sympathy with the crime in our nature, and, like Jesus, was the friend of sinners. I thought there was a tragic element in the event, that might be more fully rendered, - in the painful solitude of the man, which, I suppose, could not longer be endured, and he died of it. Read more about Hawthorne here. Griffin, Gerald R. "American Bloomsbury: Louisa May Alcott, Ralph Waldo Emerson, Margaret Fuller, Nathaniel Hawthorne, and Henry David Thoreau: Their Lives, Their Loves, Their Work." The New England Quarterly. 80.4 (2007): 721-723.